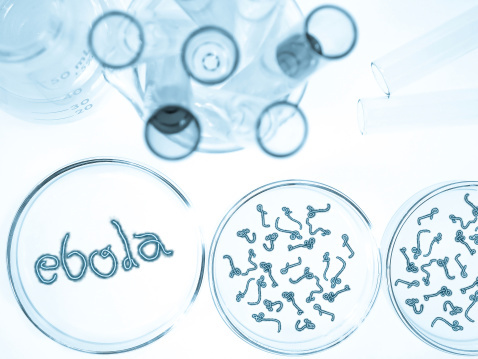 New research published in the journal Drug Discovery Research suggests that scientists have blocked the Ebola infection in cell-culture experimentations—an important step toward developing a vaccine for the virus. Researchers from the University of Texas Medical Branch at Glaveston, Texas, decided to focus on suppressing the expression of cell proteins, since the virus relies on cell proteins in order to replicate. They conducted experiments using sets of cells treated with a “small interfering Ribonucleic acid (siRNA)”—a tool used to help silence a specific protein gene. Study researchers discovered 753 different genes that could produce proteins critical for the Ebola infection. They added an “artificially created” Ebola virus and utilized a statistical algorithm that was designed to prioritize the results of the siRNA screenings. Two networks of biochemical reactions were discovered that appeared critical for the virus to enter the cells—the CAMK2 pathway and the Pl3 kinase pathway. Researchers analyzed whether drugs that could block both pathways would interfere with the infection of cells; they tested the artificially created virus and the Ebola Zaire virus—which is linked with high mortality rates. When the Pl3 kinease inhibitor was stopped, virus titers for the real Ebola virus dropped by 65%. Results were even more promising when the CAMK2 function was blocked—the Ebola virus stopped altogether. The team concludes that the study results show potential for future pharmaceutical utilization. Lam, P., “Key protein pathways critical to Ebola virus can be blocked, according to new study,” Medical News Today web site, July 19, 2015; http://www.medicalnewstoday.com/articles/296939.php.